As mentioned in my first post, I have two invasive, non-native ground cover to remove from my garden that need to be removed. I planted Sweet Woodruff without understanding its invasive nature in my “woodland” garden area. There is a pine, dogwood, red maple and red mulberry all contributing to the deep shade here. The soil is moist and acidic. The sweet woodruff is absolutely beautiful in the spring – with a carpet of white flowers and a vibrant green. This is an edible herbaceous ground cover that spreads quickly. I guess I wont miss it that much since it becomes scraggly (yes, that is a technical gardening term) towards the end of the summer and in to the fall. Vinca is a very pretty evergreen ground cover with petite purple flowers. This came with the house when I bought it back in 1998 – and it continues to grow and show up in other places around my yard, sometimes strangling my new plantings. The good news is that there is no english ivy around my house – as this is an invasive that must be removed (if you have it) as well. Each of the alternatives below are suitable and beautiful replacements. Creeping Phlox (Phlox stolonifera): This lovely semi-evergreen mats together to make a spectacular display of blue/violet flowers in early spring and stays low and green throughout the rest of the year. Green and Gold (Chrysogonum virginianum): This plant hugs the ground and is evergreen in Virginia. It creates a lovely carpet of yellow in the spring. Partridge Berry is a sweet trailing plant with shiny rounded evergreen leaves with a distinctive stripe down the mid-vein. The paired snow-white tubular flowers have four fringed petals that form half-inch stars in summer. This is a great choice for supporting pollinators and has historic significance. During the historic snow storm this past weekend here in Virginia, I decided to spend some time thinking about my garden and my continued efforts to transition to native plants. Here is a great article by the American Society of Landscape Architects that explains why. I started my garden about 10 years ago before I was aware of the importance of planting natives in the landscape. I care about wildlife and the environment and I want my garden to be beautiful and magical! This misconception is that you can’t have both. Below are some photos of my garden which includes several native plants as well as many non-natives. 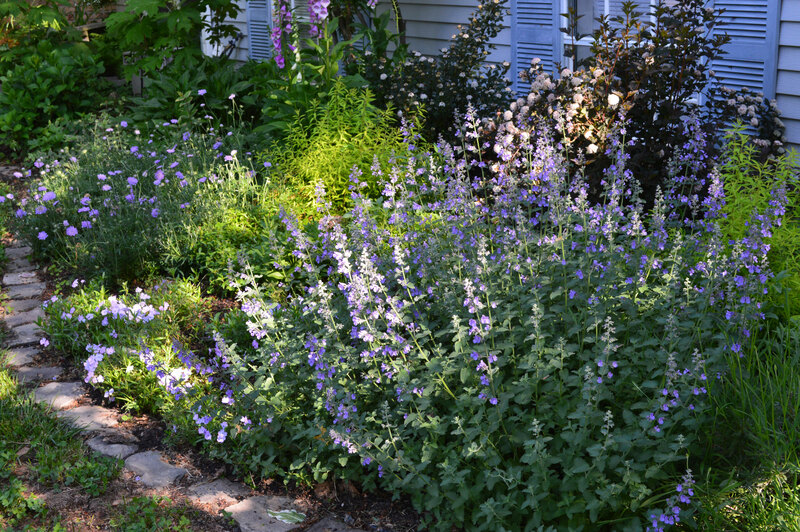 My plan this year is to remove some of the non-native invasives and replace with beautiful natives. I am going to write a series of posts focusing on one area at a time, identifying beautiful native alternatives for each area. My front garden, half is full sun, half is full shade. I have some natives growing here, but there is much to be done about some of the invasive, non-natives I have included. 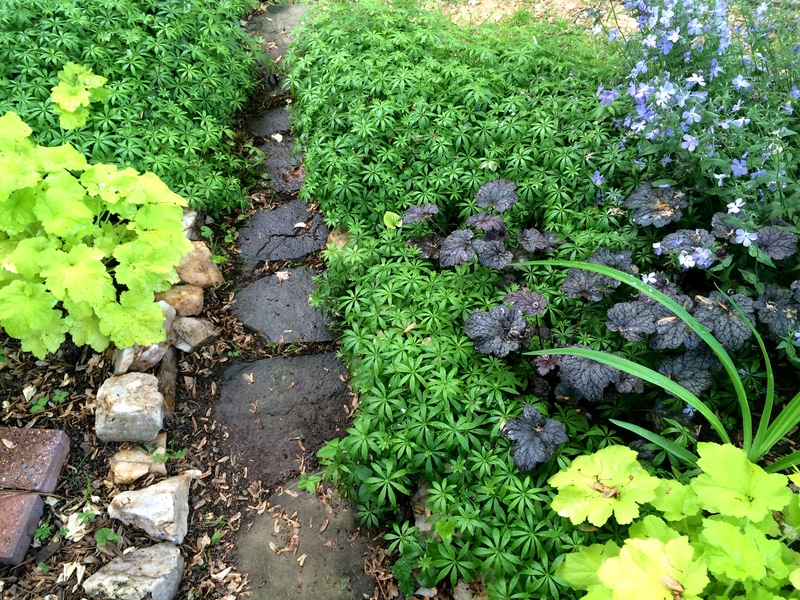 A section of my “woodland” garden – with a stone path through the Sweet Woodruff (Galium odoratum), and invasive non-native.